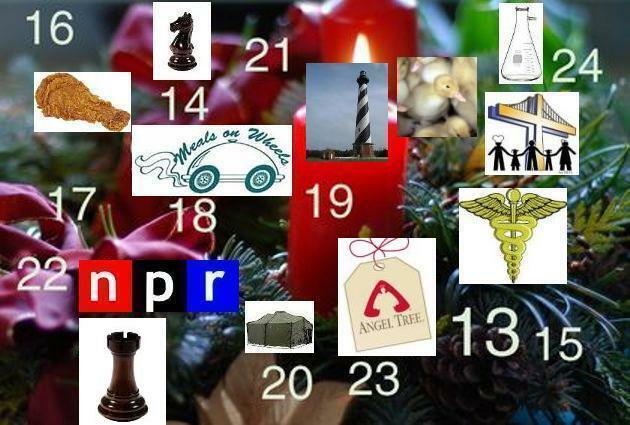 Today was the halfway point of Project Advent II! Less than two weeks now until Christmas. Are you enjoying the anticipation, the expectation, and the preparation? Are you finding a way to make Advent mean something? Today was also the second of my three scheduled visits to the All Saints chess club. It was a pretty small group today, but that was OK. It just meant that I got to play more with the kids who were there. Like I mentioned last week, I've noticed that some of the kids are struggling with the fundamentals of the game, so I picked up something extra when I was shopping for yesterday's entry. It doesn't show up well in this picture, but it's a chess set with information about each piece printed on its base, to show players what moves each piece can legally make. I'm hoping that it'll help some of the newer kids figure out the game a little bit more quickly. Here's Blake eating grapes. I just thought it was a funny picture. Nothing too exciting to report from today's hour of service, but it was still a nice time. I have a couple of good ones coming up in the next few days! Affirmation Project: Justin and Laura, you are one of the funnest, coolest, most interesting couples that Courtney and I know! You have always been so supportive to us, and we count ourselves lucky to know your beautiful family. Ok. I would like a similar picture in future posts. "And... here's a picture of a squirrel." Or better yet, SOMETHING SHINY!